Record Actions You Need To Automate The Test Complete test recording engine allows you to record actions you perform against objects with ease. With thousands of objects identified by Test Complete you can perform and record all manner of actions against different types of objects. Intuitive Test Development Environment The Test Complete key word focused development environment was built from the ground up to make you as productive as possible. 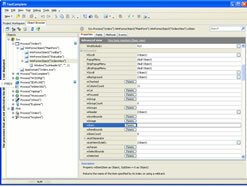 With this environment Test Complete allows you to construct your test suites quickly and with little effort. Scale tests up with Data Generation Tie your tests in with either the Test Complete built in data generator or link them in to databases and excel sheets. Either way you can create test that can be repeatedly executed hundereds or thousands of times by driving them with different data sources. Extensive Logging for Test Runs Test logs generated by Test Complete allow you to perform in depth analysis of all of your test runs. With features like log drill down and filtering you can ensure that you find the information that's important to you quickly and effectively. Integration with QA Complete With close integration with QA Complete you can centralise your manual and automated test result reporting. Once integrated with QA Complete you can also define automated test schedules so that you can leave QA Complete to worry about the continuous execution of different test projects. Ready to find out why Test Complete delivers the best price/performance combination of any software quality tool on the market? Sign up for a 30 day trial and let us show you how much easier it is to manage your test projects with Test Complete. TestComplete 8 is the automated test management tool for testers looking to increase efficiency and reduce the cost of their testing process. 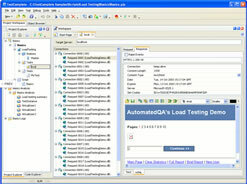 With an easy-to-use interface QA teams can implement an automation solution in minutes. And, In todays environment where time to market means everything, no QA team can afford to be without an automated test management solution that decreases execution time and reduces costs. From QA testers who need to increase the numbers of tests they are executing, to project managers facing rapid development schedules, TestComplete is the flexible solution that will deliver the results needed to help you deliver products on time and on budget. 5 Core Test Types: Supports functional, keyword-driven, load, data-driven and distributed test approaches. 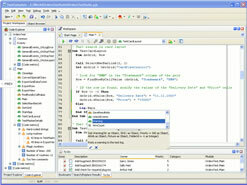 In addition TestComplete can be used to implement automated regression testing, unit testing and coverage testing. TestExecute: Light-weight automation application that takes TestComplete scripts and gives you a simple Exe which can be used to execute tests on multiple client machines. Also gives you the capability to write tests on one windows platform and then run on different windows platforms without modifications. 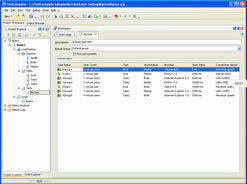 (Included with Enterprise edition of TestComplete). Test Visualizer: Capture and record screen shots during recording and play back. Test Visualizer allows you to visualize your automated tests and see exactly what your tests are doing in a story board layout. Delivering the capability to compare actual screen shots to expected screen shots gives the tester the ability to quickly pin point real failures. Advanced Reporting: Comprehensive logging and reporting which allows the tester to perform detailed analysis of results. Integration with test management tools like QA Complete gives the capability to bring together the reporting of automated and manual test management efforts. 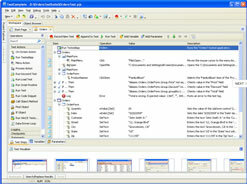 Simple Test Authoring: Test Authoring environment that gives the tester the ability to easily create key word driven tests. Yet also delivers a scripting language that is powerful enough for even the most experienced test automation engineers. To get more out of your testing resources and to reduce your overall project delivery time, take a look at what TestComplete can do for you. Users have the ability to create, manage, and run tests from any Windows, Web or Rich Client software, making it easy to quickly create and execute tests. Along with keyword testing, test visualizer and event handling TestComplete provides a feature set comparable to any other automation tool out there. 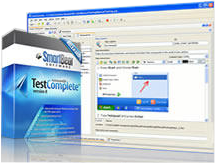 Plus, TestComplete is available at a price that is significantly lower than many other automated test management tools. With support, professional services and training, the TestComplete solution delivers the complete automation test management package.